Puncture-proof tires: a good deal ? It’s a familiar scenario when you are driving along and suddenly your car veers from its lane, and your cabin fills with the soft sound of rubber as it slaps on the tarmac. This is a common problem with many tyre manufacturers. When a tyre runs on something sharp, it will be rendered useless. This is despite the many millions of pounds invested in new technologies by tyre companies. Bridgestone has developed a new non-pneumatic tyre that is resistant to punctures. The concept Bridgestone tyres have a thermoplastic resin spoke structure placed along the inner part of the tyres. This makes the tyre look like a tyre filled with pressurised gas. However, since the tyres are airless, there is no risk of getting punctures due to nails, glass and barbs. If you are asking yourself whether run-flat tyres are puncture resistant, the answer is no. This is because these tyres are pneumatic meaning they are filled with a gas and when they are punctured, you will continue driving but at a reduced speed and for a limited distance. You should not drive at speeds higher than 50mph or travel a distance of more than 200 miles. Most likely the tyre will give out if exposed to such conditions. These tyres have numerous benefits. They not only eliminate the need to stand outside in the cold to change your tyre, but also the need for having a spare tyre (don’t forget to get ready for your meeting with your salesperson). This means that your vehicle will always be light, fuel efficient and spacious. These tyres also have some environmental benefits. One important one is the ability to recycle the resin. Tyre manufacturers say that the resin is a 100% recyclable. Airless tyres have the same level of absorption for shock as other inflated tyres without you worrying about monitoring the air pressure or changing the tyre immediately. Bridgestone combined previous inventions by NASA and Michelin’s Tweel by using the thermoplastic resin spoke which radiates out from the inner hub and protrudes from the outer rim at an angle of 45°. When combined with another set of spokes on the opposite direction, it radiates out in the other direction and results in added flexibility, strength and stability. Michelin also launched its new puncture proof Selfseal Tyre. During its launch, the company allowed a few guests and journalists to drive over vicious three-inch spikes. This stunt proved that even when holed, Selfseal tyres can be driven without any adverse effects. The tyre is currently available for owners of small cars and light commercial vehicles. Selfseal tyre by Michelin uses a patented rubber compound which is housed inside the tyre and plugs itself permanently on any holes on the threads of the tyre. This enables Selfseal tyres to be driven faster and longer even after getting a puncture and not lose any pressure. This is a liquid chemical which is installed in a standard tyre to prevent a driver from getting a flat tyre. Installing the liquid formula is not a complex process and you do not have to remove the wheel. Ultraseal is installed just like air pressure and once installed, it will guard your tyre against punctures by sealing and curing any leaks as they occur. Ultraseal has been tested by Shell Research Laboratories and proven to be safe and functional. If you have had a high-speed tyre blowout, you know that it is terrifying and dangerous and it can happen anytime without warning and make your car, caravan or motorcycle difficult to handle and risk your life and that of your passengers or loved ones. Ultraseal can be used to inhibit slow punctures. Slow punctures are the major cause of tyre blowouts and are very difficult to detect. Consider installing Ultraseal to avoid being placed in a potentially unsafe and life threatening situation. This is a type of tyre which is composed of polyurethane synthetics that are fabricated to the rim. It measures 155/590 R14. 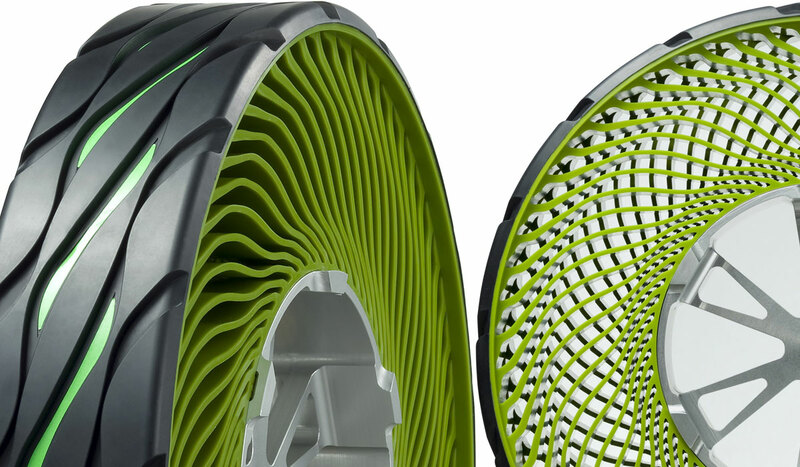 The tyre has geometric cells that enable the tyre to function without the need for air. This means that you will eliminate the stress of checking pressure and fixing flat tyres. Driving is possibly the most dangerous activity people engage in everyday. You can protect yourself and your loved one by using puncture-proof tyres.